Although it's quick and simple, a list can be just as educational as it is easy to read. That's the idea behind TravelsinTaste.com's new "Lists" feature, which includes lists of some of the country's most exciting food trends, innovative ingredients, unusual restaurants, intriguing cocktails and more. Our editors have scoured America's kitchens, markets and menus in search of the most up-to-date, unusual items for your reading -- and dining – pleasure, then published them in a convenient, easy-to-chew list format. Scan, savor and enjoy! Snickers and Twix bars are all well and good but maybe you'd like a chocolate that is a bit more refined, a touch more sophisticated. If you've got the money, and are willing to part with it for a taste of rich, chocolate decadence, there are plenty of chocolatiers ready to make the trade. These are the top five most expensive chocolates you can find. Based in Dallas, Texas, Noka produces chocolates made from the rarest single-source cocoa beans from Trinidad, South America, and Africa. 75% pure cacao mixed with cacao butter and sugar, there are no extra flavors to be found in these chocolates, not even vanilla, a common ingredient used in chocolate making. 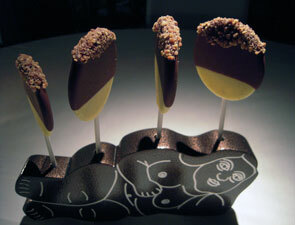 The resulting taste is simply and undeniably chocolate. A pound of this pure, chocolate flavor will cost $854. This Connecticut-based chocolatier makes a truffle so expensive that it must be ordered in advance. The Madeline, made with a ganache of 70% cacao Valrhona chocolate, fresh cream, vanilla pods, and truffle oil, wrapped around a French Perigold truffle, and dusted with cocoa powder, may very well be the world's most expensive truffle. Each truffle comes with a serial number and a card, personally signed by Fritz Knipschildt, the founder of the company. They are sold at $250 each, making them about $2600 per pound. This chocolate bar enjoyed an eight-year run that ended in 2003. However, a recent Facebook group called “Bring back Cadbury's Wispa Gold” caused enough of a stirring, with its 22,000 members, to make Cadbury relaunch the bar. The event is being marked with a special edition bar which is essentially the normal Wispa Gold, a caramel-filled, milk chocolate bar, covered in edible gold leaf and wrapped in a gold leaf wrapper. The price is set at £961.48, or about $1,567.86. Only in New York can you find the world's most expensive chocolate dessert. About three years ago, Stephen Bruce unleashed the Frrozen Haute Chocolate, a sundae infused with 5 grams of 23-karat edible gold, a blend of 28 cocoas, 14 of which are the most expensive and exotic from around the world, topped with whipped cream and more edible gold, served in a crystal goblet lined with edible gold, a 18-karat gold bracelet with 1 carat of diamonds at the base, and eaten with a golden spoon embedded with white and chocolate colored diamonds. The latter two items are to be taken home. 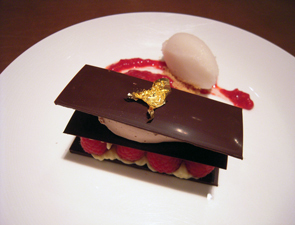 This dessert is served with a Madeline truffle from Knipschildt on the side. It can all be yours for $25,000.